This chapter describes clinical approaches to accessing the inner world of the young child. Based on their lived experiences, young children develop increasingly complex internal representations of the world around them and the people in it. In turn, these representations and the “relational scripts” associated with them powerfully shape children’s ongoing interactions with others and their responses to environmental events. Insight into the child’s inner world is thus an essential component of the clinical assessment. 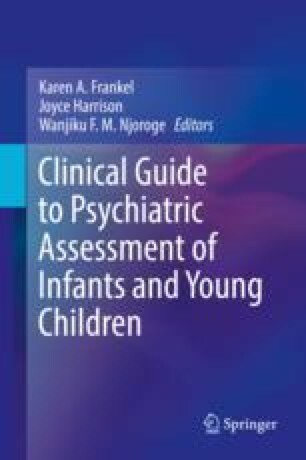 The chapter begins with a discussion of clinical practices applicable to play-based assessment of young children, including descriptions of ways to help the child feel comfortable, the general stance of the clinician, participation of caregivers, materials that can facilitate meaningful communication, and recommendations regarding the structuring and sequencing of evaluative sessions. The chapter then turns to specific approaches to assessment, organized around two age periods: birth to age 2, and ages 2–5. Detailed descriptions are provided of the major developmental changes occurring during these age periods and of specific tools and approaches likely to be useful at each developmental level. Clinical examples are used throughout. A detailed case vignette and a summary chart of children’s play across ages 0–5 are presented at the end of the chapter.